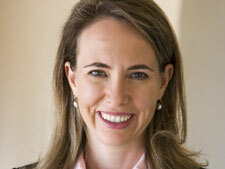 Today a U.S. Congresswoman was shot in the head because of politics. Somehow, she is still alive, but six others are dead, including a nine-year-old girl and a judge. Everything I’m about to say has probably already been said by someone else, but still I feel compelled to say it. I feel that issues of politics are important. Who is elected, the legislation they create, and how they vote are all important aspects of our collective and individual lives. But none of that is more important than issues of humanity. Regardless of what you or I think about abortion, immigration, health care, or gun control, we must all agree on a higher standard of humanity in our country, both in how we deal with each other and how we deal with the world. Obviously the vast majority of people would agree that shooting others is wrong. Killing a nine-year-old child at a grocery store because of politics is wrong. But how did this sad 22 year old get to this place? And did we play a tiny part in it? That is a question we all need to ask. Sarah Palin and others have used incendiary images and language to garner support for their political ideals. I think that today’s events are proof that this needs to stop. Too late I am adding my voice to this chorus of Americans and others around the world calling for peace in our interactions. Please. It is already too late for that child and the four other people killed today. But it is not too late for others who may be hurt if this continues. Regardless of whether you vote with Sarah Palin on issues of politics, we need to stand up as individuals and say that incendiary images and language are not right, responsible, or in line with our ideals as Americans. My seven-year-old son asked for a replica of the Statue of Liberty for Christmas this year, and he was so happy when Santa brought him one. He will proudly tell you that this iconic monument symbolizes freedom, but how free are we if our leaders are shot just for doing their job? A job that their peers elected them to do? 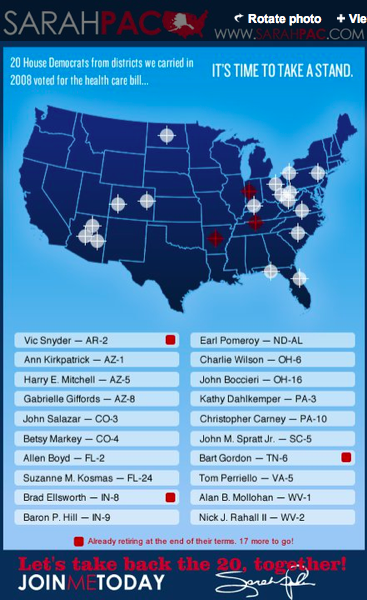 Sarah Palin used the image of the crosshairs of a gun in her graphics in the fight leading up to the November 2010 elections, singling out Gabrielle Giffords and 19 others. She has used violent imagery in her writings, exhorting her supporters, “Don’t retreat—reload.” Other political leaders have been guilty of similar violent escalations. And individuals as well; protesters have come to events featuring President Obama carrying assault rifles and other weapons. These threatening words, images, and actions are implying a horrific act that was played out today: go against what I want, and I will shoot you. The fact that these threats have been made by political leaders is inexcusable. Our constitution supports free speech, the right to gather in protest, and the right to carry firearms. There are sound reasons, if much debated, for these rights. But I’m not talking about issues here. I’m not talking about our constitution. I’m not talking about our rights. I’m talking about what we socially allow as acceptable, and what we do not allow. We have collectively allowed Sarah Palin and others to behave in this way because we have supported them. Perhaps you don’t support Sarah Palin, but many, many Americans do. People follow her Facebook account. Magazines put her on their cover. People buy these magazines. The news media gives her air time. People watch her on TV. If, as individuals, we began writing her and demanding that she stop her escalations of violence, and if she refused we then stopped reading about her or watching her on TV, we would impact her. This is a fact because she has no power independent of us. She has no job other than that of a TV reality show star, and if no one watches, that job will be taken away as well. The only power she has is what we give her. We love the image of our country as “a shining city on a hill,” as Ronald Reagan said, “whose beacon light guides freedom-loving people everywhere.” The responsibility of maintaining this ideal lies with each of us. If we want our country to be a place that offers freedom to others, then we must offer freedom to others, even if we do not like them or agree with their ideas. Sometimes it seems that we cannot control much if we are only a mom, or a dad, or a worker. But this is not true. We can control ourselves, how we live, what we support. If we all collectively decide that something needs to change, it will, because we will each make that change in our own lives. It is time to declare a more peaceful standard for how we interact. We must demand more peaceful interactions in how people interact with us, and support only those who conduct themselves peacefully with others. Making an idle statement like putting someone in your cross-hairs is not enough to cause someone to take up arms and kill another person. And in this particular instance the shooter claimed to be a liberal, his youtube page has the Communist Manifesto as a favorite book, and on the Daily Kos he wrote that Gifford was dead to him for not supporting Nancy Pelosi. He was angry at Gifford for being too moderate. So did politics cause Loughner to shoot Gifford, absolutely. But it was his ultra left politics.